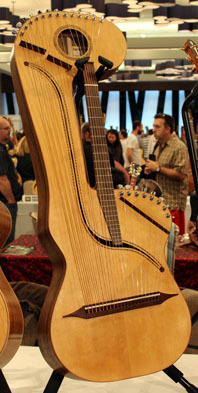 The number of Canadian harp guitar builders lately seems to be exponentially growing, which is great! Alas, I had no information for Marlowe and couldn’t give him much of an opinion. It looks like the “label” is a simple business/address card of the day, with G. Jenkin’s musical particulars written in. That, and the design and overall quality (ignoring the charred remains of an apparent fire), makes me think “homemade,” as in an amateur’s experiment. Still, it may have been a perfectly adequate, or even professional, instrument for someone. What do you think? – to me, it seems influenced both by c.1900s Austro-German instruments and also American harp guitars like Almcrantz’s. 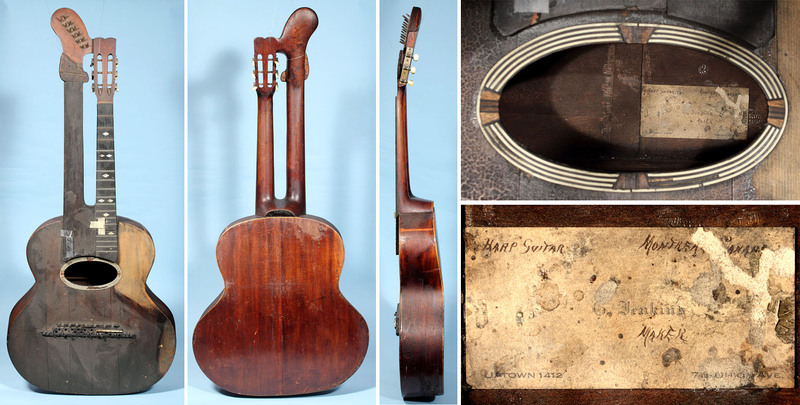 He labels it a “harp guitar,” something he would’ve picked up only from an American instrument. Anyway, it was kind of nice to find that c.1900 Canadians were not totally sitting on the harp guitar fence. We then skip several decades until a couple of much later Canadian guitar makers did a few experiments of their own. Michael Dunn (New Westminster, B.C.) and Charles Shifflett (Alberta) each made an early steel-string instrument, with Michael continuing on with all sorts of Knutsen-inspired instruments, and Charles still with an active web site. 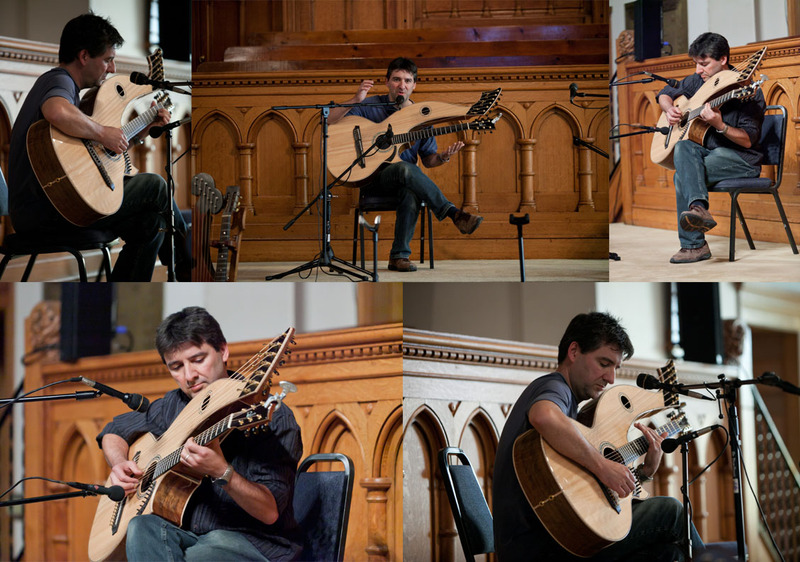 In other musical circles, Sergei de Jonge (Quebec) built a couple of modern classical harp guitar creations for Ted Lebar, Tyler Hawkins and others. Meanwhile, flamenco guitar builder Jeff Sigurdson (Vancouver, B.C.) was quietly making Dyer copy after Dyer copy for private customers. 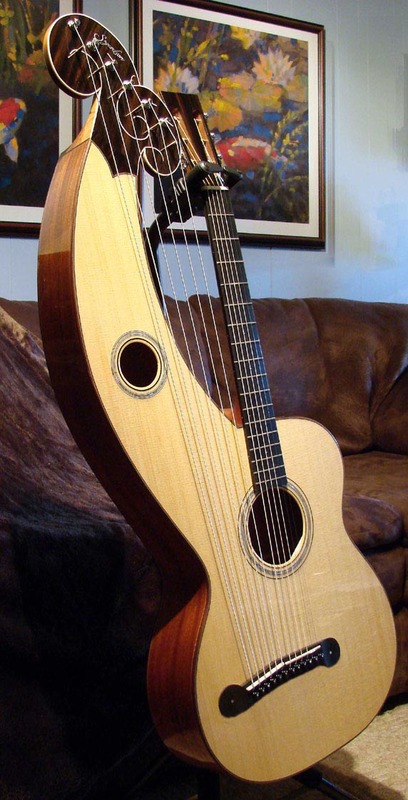 A slightly more modern version of the classic steel-string instrument, when I learned that they were well-regarded and priced right, I commissioned a few for Harp Guitar Music (which sold quickly to happy customers). Of course, along the way, Linda Manzer (Toronto) created the infamous “Pikasso” for Pat Metheny, following it up with a copy for the late Scott Chinery, then two more original multi-harp-guitar creations. More recently, acclaimed innovator Allan Beardsell (Winnipeg, Manitoba) got into the game with his own distinctive design (he’s on his 3rd or 4th now, I forget), followed shortly by Tony Karol (Ontario), another popular acoustic guitar builder, who immediately got order after harp guitar order (up to at least 4 or 5 now?). 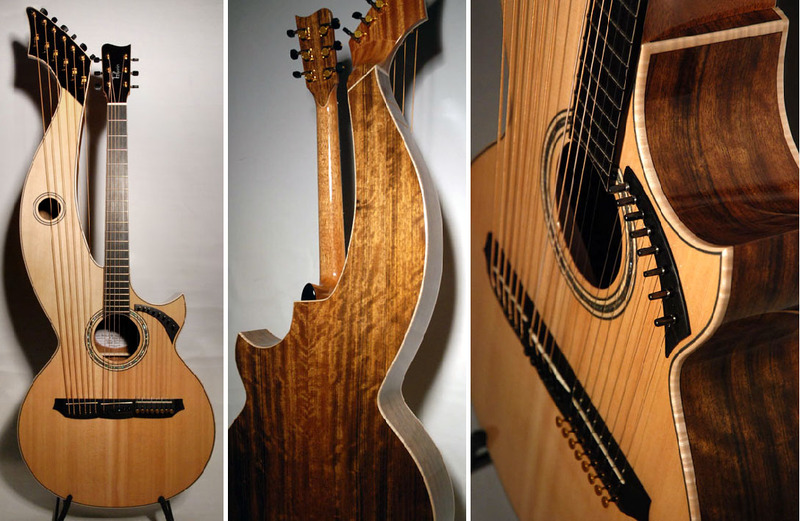 Of course, there was also the news-making harp guitar for Andy McKee designed and built by Michael Greenfield (Quebec), which I finally got to hold in my hot little hands earlier this year. 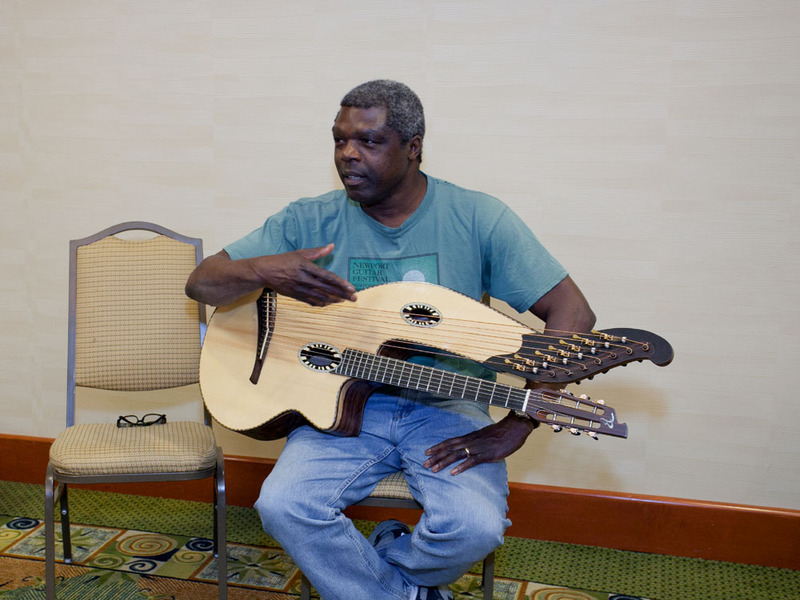 I also finally got to play one of Allan’s great instruments at last year’s Gathering (thanks to owner Esau Simmons), and also the first harp guitar by Michel Pellerin (Quebec), built for Claude Laflamme, who attended his first Gathering. Inspired (and “blessed”) by Mike Doolin, it was a very fine instrument as well. 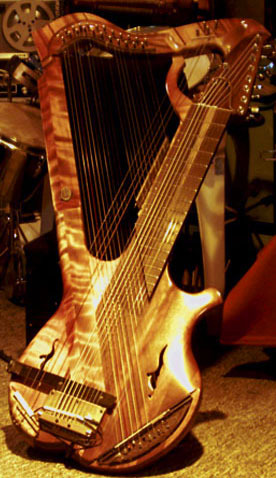 I hear that one of the Karol harp guitars may be showing up at HGG10, so that’ll just about get my “hands-on” up-to-date! Well, at least on the “normal” steel string side. 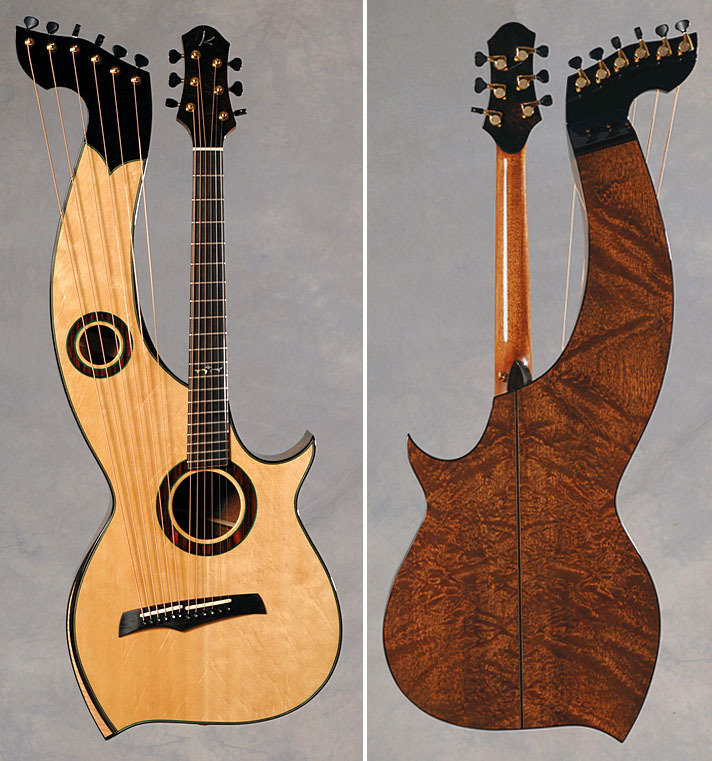 There are also some recent “early romantic” gut-strung reproductions by Scot Tremblay (Victoria, B.C), and a unique “modern Schenck bogengitarre” with 21 strings (which may actually be steel?) built by Hubert Soumis-Pilon (Quebec). Most unique of all is the (pre-1997) Harp Stick (or stick-harp) for player Naki by Yvon Robert (Quebec) – pretty wild!